Warm rainstorms eased Tuesday after causing mudslides and warnings of record flooding to Western Washington, killing at least one person and forcing rescues by the National Guard. The National Weather Service reduced flood forecasts along at least one major river, the Skagit, after rapidly rising rivers caught hundreds of residents by surprise in low-lying areas. Mud and rock slides blocked a number of highways and delayed an Amtrak passenger train. 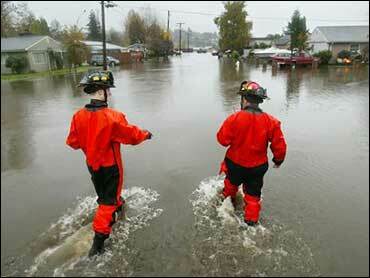 Flood warnings continued on 14 Western Washington rivers. The weather service said the steady drenching should change to rain showers by Tuesday afternoon, with Wednesday and Thursday dry before another Pacific weather system brings more rain and wind on Friday. One record fell by nightfall Monday as the flow on the south fork of the Snoqualmie River east of Seattle reached 51,970 cubic feet per second, exceeding the mark of 50,000 cfs set in December 1996. Forecasters said the river flow could reach 69,000 cfs before subsiding. Helicopters and hovercraft were pressed into rescue service as Gov. Chris Gregoire declared a state of emergency Monday for 18 counties, authorizing mobilization of the National Guard and directing the state Emergency Management Division to coordinate assistance after more than 6 inches of rain fell in 24 hours in some areas. Tens of thousands of schoolchildren got the day off from classes or had to do without bus service. Stampede Pass in the Cascades east of Seattle had more than 8 inches of rain in a 24-hour period ending Monday afternoon, and Seattle-Tacoma International Airport recorded nearly 4 inches. Rainstorms propelled by air currents from Hawaii, a pattern known as the Pineapple Express, also caused severe flooding in southwest British Columbia, forcing the evacuation of about 200 people in the Fraser River valley near Chilliwack, about 60 miles east of Vancouver. The weather service warned officials in Skagit County to expect worse conditions than in 2003, when flooding caused $17 million in property damage in Concrete and 3,400 households were evacuated. Shortly before midnight high-water predictions along the Skagit River were reduced to 40.5 feet from 43.83 feet at Concrete, where the crest was expected early Tuesday, and to 36 feet from 38.07 feet downstream early Wednesday at more populous Mount Vernon. Mount Vernon Mayor Bud Norris declared a civil emergency late Monday, and volunteers worked through the night to build a sandbag wall downtown next to the river. Amid earlier warnings of record flooding, more than a dozen Guard personnel were sent late Monday to rescue an unknown number of people in Skagit County, and another 150 troops were expected Tuesday, county spokesman Don McKeehen said. Officials had recommended residents leave before water blocked their escape route from small towns near Concrete, just west of the Cascade foothills in the central part of the county, McKeehen said. In North Bend, about 30 miles east of Seattle, the Snoqualmie River slopped over a levee, prompting an urgent call for residents of two neighborhoods to evacuate, King County spokesman David Tushin said Monday night. He could not estimate how many people were affected. About 200 to 225 elk hunters were evacuated Monday from camps near the Cowlitz River in southwest Washington, Lewis County Sheriff Steven B. Mansfield said. One hunter, Andy McDonald, 20, of Seattle, died when his pickup truck was swept into the Cowlitz. His body was recovered late Monday. More than 100 students at an environmental camp in southwest Washington were evacuated for fear they would be cut off by high water. More than 80 people were rescued from flooding in Snohomish County, north of Seattle, including several transients taken to safety by a sheriff's helicopter after they were stranded on a sandbar where they had been camping. The Herald of Everett reported that Chris Johnson, 37, tried to rescue two neighbors, Pauline Lindsey, 59, and Carl Gott, 65, when the South Fork of the Stillaguamish River surrounded their home, but his dinghy was hit by a log in the swift current and began sinking. Johnson was stranded in a nearby vacant home, also surrounded by water, and all three — as well as the older couple's two dogs and two cats — were rescued Monday afternoon by county crews using a hovercraft. "We've been through this before, but it's a bigger deal this time," Gott told the Herald. "Everything will be fine. It's just a mess to clean up." Upstream along the Stillaguamish, whole trees swirled in the turbulent current. "I've never seen this much debris come down," state fish and wildlife Officer Richard Oosterwyk said. "It looks like a doggone forest." Boats also were enlisted to search for and rescue stranded people in eastern Lewis County, Deputy Sheriff Stacy Brown told The Seattle Times. "It can be pretty hairy, especially in the dark," Brown said. "We're not sure how many people are still out there." Evacuations also were reported in Puyallup, Orting and other areas east of Tacoma. A large mudslide near Skykomish, northeast of Seattle, blocked eastbound lanes of U.S. Highway 2, the state's second most heavily traveled east-west artery, and a mudslide earlier Monday near Tacoma delayed an Amtrak passenger train. Officials at Mount Rainier National Park, which had more than 10 inches of rain in the 24 hours ending Monday afternoon, closed the main park road, turned away visitors and sent employees home early via the only road open. "We want to prevent visitors getting trapped inside the park," Superintendent David V. Uberuaga said. "The road is vulnerable to washouts in several key places, and there is only one way out."